In Whose Mouth Are You Placing Your Words? “In Whose Mouth Are You Placing Your Words?” is an expanded version of a talk I gave in Copenhagen in May 2015, at the Arctic Encounters conference. Thank you Nadia Myre and Donald Weber for allowing me to reproduce images of your powerful work. Thank you Winston Lau for your photographs of my Core Sample experiments. Thank you Lars Jensen for inviting me to be a keynote speaker at Arctic Encounters, and for all your generosity and humour. This is a draft of my essay. An edited version with high resolution images has recently been published in the UK based journal, Studies in Travel Writing. Ice splits, rock shifts, water carves and carries, wind scours; in the Arctic, the wordless travel writing of the elements informs all further accounts. Weather decides what story will be lived. The distance from A to B is determined by how suddenly the ground gives under your feet, or the sea swells beneath your boat. The length of a fjord is measured in terms of duration not kilometers, and varies from day to day. A man enters a blade of grass and lives contentedly until the swaying of the wind-tugged blade nauseates him, and he escapes by slipping inside a raven. When his feet grow cold he abandons his life as a bird to become a caribou. In Inuit myth there is no fixed address, life and death overlap, neither breath nor words are wasted. Such traditional narrations, often elliptical, loop repeatedly, indicating what direction physical or moral should next be taken. For those of us, qaluunaat, arriving in the contemporary Arctic as travelers passing through, the challenge of telling the story of our visits in ‘new’ ways, if such exist, is daunting. We each must find our own means of acknowledging the weight of foreign story we bring in our luggage, and of pointing to the contemporary truths of the territory we are ‘exploring’ and ‘discovering’, aware that the very language in which we write is mired in centuries of Eurocentric distortion and entitlement. Can material and psychological duress caused by ongoing social injustice be respectfully depicted by an outsider? To listen, to advance slowly, would seem a possible approach, yet our very curiosity constitutes an infringement, a perpetuation of colonial incursion. And what of the tropes of heroism and the sublime, so tempting to recreate when confronted by a vast ‘landscape’, an ‘untamed’ immensity? If we did not believe in the possibility and desirability of taming, with what adjectives would we describe the Arctic? The Inuit go ‘out on the land’. No mention is made of ‘wilderness’. Such words as ‘land’ and ‘time’, we must rethink in writing about the Arctic. In this essay, the ‘Arctic’ to which I refer will be the Canadian Arctic only. My focus will be on my recent novel, The Search for Heinrich Schlogel – the outcome of my travels on Baffin Island, and a work in which travel writing, both fictional and historic, play a central role. But first I’d like to look briefly at a series of portraits by Canadian photographer Donald Weber, portraits that function as core samples, revealing the vertical nature of time. In 2011 Weber travelled to Igloolik in Nunavut, where he visited Ataguttaaluk High School. It was Easter weekend and members of the community had gathered for a dance. He asked those present if they would like to pose. In the portraits he took, the light illuminating each individual comes from whatever technological devices were close a hand (mobile phones, games, television screens, etc.). In making this series, Weber was inspired by a set of photographs taken in the early twentieth century by Robert Flaherty (the director of the film, Nanook of the North). The faces in Flaherty’s work were illuminated by seal-oil lamp. Bathed in the blue light of contemporary life, the subjects of Weber’s photos, to my eye, appear ghostly. Though immersed in the present they look haunted; from this faint blue light layers of absence and silence, of time and history are released, a history that includes many false portraits. ‘The lived durée,’ writes John Berger, ‘is not a question of length but of depth or density’ (Berger 1984, 35). ‘”Quniqjuk” means “indistinct, hazy horizon”’ (Webber 2011, 143). 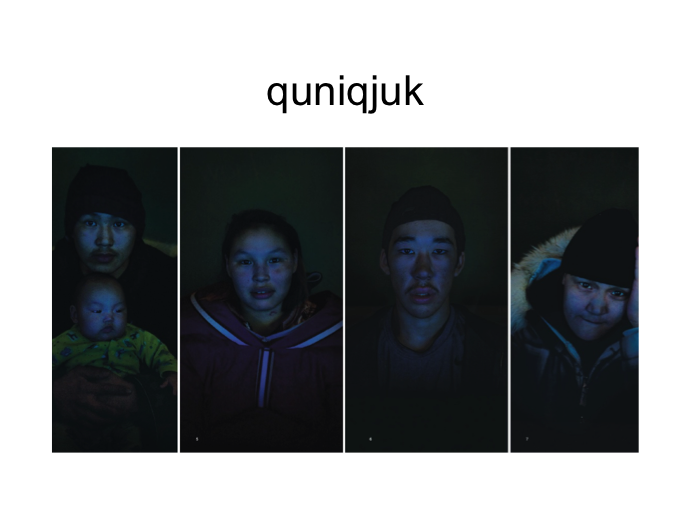 Weber titled his series of portraits, Quniqjuk, Qunbuq, Quabaa. ‘”Qunbuq” means “the brightness on the horizon that indicates the presence of ice on the ocean”‘ (ibid); and “quabaa” means ‘where someone seeks “to split, separate, loosen things frozen or otherwise fused together”‘ (ibid). My hope in writing the Search for Heinrich Schlögel was to express, as powerfully as these images do, time speeding up for the Inuit, and time accelerating for all of us in a changing climate. In my novel, I take a young German, Heinrich, pluck him from Tettnang, a small, claustrophobic, hops-growing town on the shore of lake Constance, and send him on a solo, two-week trek into the interior of Baffin Island, and there I do something nasty to him. The year is 1980 when he sets out from Pangnirtung, a hamlet north of Iqaluit. Upon his return, the year is 2010 but he has not aged. Because the arrival of Europeans on Baffin Island dislocated time for the Inuit, and because Europeans, in the late nineteenth century, took Inuit from Labrador to be displayed in Zoos in Berlin and Prague, I wanted to turn the tables on my European, to subject him to an inexplicable experience that would make him a potential object of public scrutiny. I was curious to discover how Heinrich would cope, dropped without warning into the digital age, and burdened with having seemingly slipped through a hole in time. Not only will Heinrich land unexpectedly in the digital age but time speeding up will also manifest itself for Heinrich in the form of a rushing sound in his ears that grows steadily louder near the end of the novel. 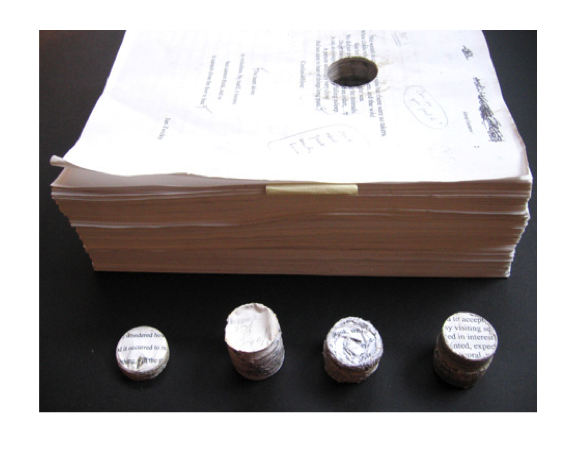 Long before visiting the Arctic, I drilled and removed a core sample from the manuscript of a novel I’d written. I did so in part because my manuscript contained within it a silenced, earlier version of itself. Taking a core sample, I was attempting to locate this ghost narrative, to give physical expression to writing as accretion, writing as tension between burial and revelation. 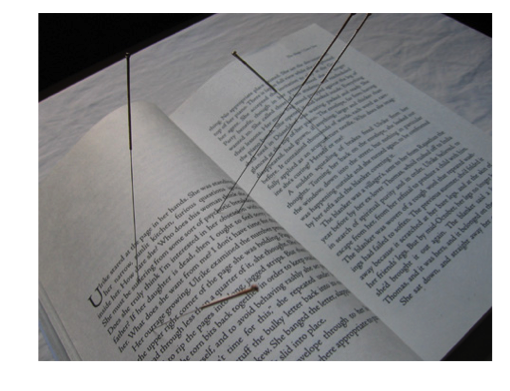 Next, I opened the book and applied acupuncture needles to certain words. Doing so might allow me, I hoped, to engage with others in a conversation about book as body; how the stories that others tell about us enter our bodies, the language of others inhabiting us, unbidden; how stories determine the narrative flow of our lives. In July 2010 I flew from Toronto to Ottawa, to Iqaluit, to Pangnirtung, a hamlet on the East coast of Baffin Island. With me travelled a fictional young man named Heinrich Schlögel, a half-formed protagonist luring me on a two-week hike into Auyuittuq park, in the company of five other travellers and two guides from Blackfeather, a travel company based in Parry Sound, Ontario. Our food flew in with us, the ingredients of each breakfast, lunch and dinner packed into plastic bags labeled, day 1, day 2, day 3, etc. to be distributed between our knapsacks. When Blackfeather’s equipment was retrieved from storage, one barrel had gone missing. Suddenly we were short by two tents and two stoves. No panic ensued. It was understood that in the Arctic objects do not hold still from one year to the next. They wander and return. Our guides borrowed a stove from two hikers headed in the same direction as us, who by sheer good luck had brought an extra one with them. A woman in our group, a botanist marking her fiftieth birthday by making this journey, had brought her own tent – a further bit of good fortune. Instead of two per tent, we could be three. We set off. The weather was kind to us. Upon our return, two weeks later, the missing barrel of equipment reappeared from under a tarpaulin in the corner of a shed. The assigning of function to object, of duration to event, of value to occurrence – these are determined by many factors when out on the land. As I passed through security in the Ottawa airport, on my way to Iqaluit then Pangnirtung, slipping my watch, earrings, and laptop into the plastic tray provided, the woman standing next to me, an Inuit hunter flying home to Iqaluit, picked up one of the trays and examined it, grinning. ‘Good for storing meat,’ she declared. Straight away in my mind’s eye, tray after tray of fresh seal meat, richly bloody, sailed along the conveyer belt and into the x-ray machine. In the late summer of 1977 American writer Howard Norman travelled to a remote community on Hudson Bay, with the intention of transcribing and translating the Noah stories of an Inuit elder, Marq Nuqac. An American arts/ethnography group called Write What You Speak had hired Norman, and provided him with a crash course in Inuktitut prior to his departure. Upon arriving in the Arctic he discovered that he was not to be the only translator working with Marq Nuqac on the Noah stories. Helen Tanizaki, an accomplished ethnographer, fluent in Inuktitut, was already there. A complex friendship evolved between the young, inexperienced Norman and the quiet but self-assured Tanizaki, a bond deepened by shared isolation and by the fact that Tanizaki was dying of stomach cancer. Norman waited several decades before recounting his journey. In 2005 his spare memoir appeared, In Fond Remembrance of Me. It included Marq Nuqac’s Noa stories, eleven of them, translated and transcribed – tales about the fragility of survival. Noah is a traveller who cannot move, a captain whose ship is caught in the ice. He is also a man frozen in an obstinate refusal to comprehend his surroundings. The Inuit offer to assist him. They request a few boards from the ark to make a fire. Noah turns a deaf ear. They ask for an animal to eat; after all the boat is crammed full of howling, barking, growling, creatures. Noah heaps curses upon the Inuit for making such a suggestion. I came upon Howard Norman’s book by accident. It stared at me from the shelf of a Toronto public library as I searched in vain for a different work. I had read, several years earlier, the Inuit tale of the fox wife, a story I retold within my novel. I hoped to acknowledge the author upon whose written version I had based my telling, but the book, true to its oral origins, had travelled free of the library’s shelves and vanished from the catalogue as well, rejecting fixity. Howard Norman’s memoir entered my life instead. I opened it, and time became a Mobius strip. The rhythms of the telling were those of an Inuit tale; I sensed this was not intentional, but so finely tuned was the author’s ear to language and place that his narration had absorbed the rhythms and logic of the Arctic. If I put false words in the mouth of my character, he or she becomes a ghost, a being suspended between life and death. In my novel there are two Inuit characters, Vicky Pisiulak who is 18 and Sarah Ashevak, her 70 year old grandmother. Capturing Sarah’s particular English was difficult. By the time I had written the manuscript of the novel, over two years had passed since I’d been in Pang and spent time with the woman Hannah Tautuajk, who inspired my portrait of Sarah. Hanna’s intonations still rang in my ear and I felt inhabited by all that I had observed and intuited about her, but her exact grammar and vocabulary I had lost, and these I had to portray accurately. My recreation of her English, I asked an Inuktitut speaker, someone who lives in Pangnirtung, to assess. But the accuracy of my understanding of Hannah I could not ask anyone to verify. One of the sources of anguish for writers of fiction is the unverifiable nature of the truths we attempt to extract from what we observe. The degree to which the fears, desires, and ambitions of a writer, even an objective, academic writer, determine what is revealed and what is suppressed within a text cannot, of course, be overstated. As the Canadian experimental film maker, Mike Hoolboom, so aptly puts it: ‘the self, or the desire that fuels the self, is an engine that creates appearances and disappearances.’ Writing about the postcolonial Arctic is by definition writing about what fuels appearances and disappearances. In The Search For Heinrich Schlogel, Heinrich has a sister, Inge, who has a talent for languages, but is emotionally unstable. She comes upon a set of Teach Yourself Inuktitut tapes in her high school library. She shuts herself in her room to study. Her admiring younger brother hovers outside her door. To distract him, to provide him with a passion of his own, Inge gives him the diary of Samuel Hearne to read. Heinrich is a slow reader; he mostly spends his time copying out passages from books about the lives of animals, or hiking with his father, or cycling alone through the countryside. Hearne, the British explorer, becomes Heinrich’s hero. I wanted to examine, in this novel, the idea of how territory is assigned to children, psychological territory within a family; how siblings can idealize or demonize each other just as nations do each other, assigning talents and abilities, everyone limiting one another and unable to become whole, unwilling to allow wholeness in themselves or in those designated as ‘the other’. My entire novel is told by an un-named German, living in Toronto, who has seen a photo of Heinrich in a Toronto newspaper, a photo accompanied by a text that reveals little about him but mentions that the police are looking for information regarding his whereabouts. My novel’s narrator becomes obsessed with finding out all that he or she can about Heinrich, tracking down letters, more photos, a spinning top, diary entries, and creating a Schlögel archive. The novel’s narrator readily admits that someone else exploring the Schlögel archive might well arrive at a different narrative. Footnotes throughout the novel are used by the narrator (become archivist) to comment on his or her process of research and to drop clues about his or her own life and motives for wanting to know the truth about Heinrich. The ticking of fifty-seven clocks. On her living room sofa, Sarah sat, listening to their chorus. Take away fifty from fifty-seven, what do you get? A seven-year-old girl, a girl who got sick and was taken south to the hospital, then put in a school. A man has fifty apple trees and he plants seven more, how many trees grow in his orchard? An apple is a fruit. It does not grow close to the ground. An apple is much bigger than a blueberry. Once a woman picked an apple because of a snake. She obeyed the snake and bit the apple and gave it to her man to eat and they both were punished for being naked. At seven years old Sarah had never held a book in her hands. She knew how to read, but not books. Sky and water, faces and the actions of people, the behavior of dogs, of seals, of fish, and of ravens—these she knew how to read. She knew how to read stories that do not hold still, stories that go away and sometimes come back, pretending to be a new story. In the hallway of the school, the school where she was sent to learn, a round, gold disc caught her eye and she walked over to it. She stood in front of the grandfather clock and the clock’s steady ticking swallowed the voice behind her, a sharp voice telling her something she did not understand; she fixed her eyes on the gold disk and the ticking grew louder. A man has twelve cows. If he sells half his cows, how many does he have left? 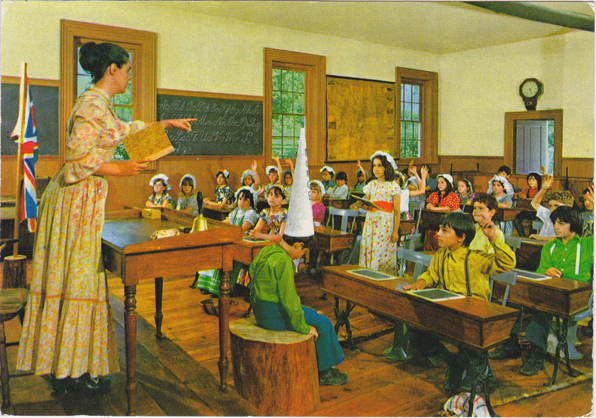 In the classroom they sat in rows. She asked, ‘What is a cow?’ She asked, ‘Do people hunt cows?’ She received no answers. She asked, ‘Why does the man want to sell his cows?’ She asked these questions in Inuktitut because she did not know what to expect of English words, what they might turn into if she mixed them together. Sometimes English words were thrown at her; other times they drifted by, and some of them she caught and even savored. But she thought in Inuktitut. She did not invite her ideas and her questions; they arrived of their own accord, and they arrived in Inuktitut. She turned and spoke her thoughts aloud to the girl seated beside her. Her head filled with more questions. If the teacher could have seen inside her head, he would have scrubbed away all her thinking, scraped out the dirty Inuktitut words that were constantly forming new equations and more questions inside the safety of her skull. How many apples did the woman in the garden eat? Was it because the snake gave her the apple that she was punished for eating it, or were all apples bad? If apples were bad, why did a man with fifty apple trees plant seven more? When is a garden called an orchard? If the woman in the story was not allowed to eat an apple, why am I given an apple at lunch and what will happen to me if I eat it? Will I lose my clothes? If the story about the garden isn’t a warning, why tell it to me in such a serious voice, in the sort of voice used to tell someone not to walk on the ice in that place where it is too thin? Though she was hungry, and the apple was the first piece of fruit she had been given since her arrival at the school, Sarah refused to eat it. She received a lesson. She received it with open hands. She held out her palms and a wooden ruler bit her skin. From that day on, when given a piece of apple, she pretended to eat, hiding bites of apple in her cheeks, to be spat out later, to be swallowed only as a last resort. And she hid her language under her tongue. When a word wanted to wriggle out, like a worm, she swallowed it quickly and clamped her lips shut. Words slithered back up her throat and into her mouth. She kept her teeth pressed tight together, so the wriggling words wouldn’t show. When it was over she stood in the front hallway and stared at the golden disc. When she received a lesson for breaking a rule, she hid her throbbing hands in the slow and steady ticking of the tall clock. Outside the school, she was not much safer than inside the school. Outside, trees grew, trees full of leaves that made an awful sound, the sound of something approaching, and of something trying to free itself. In writing this novel I was very much inspired and guided by the works of several contemporary First nations visual artists. Wandering through art galleries was my first form of travel, in search of Heinrich. In 2002, in the Vancouver Art Gallery, I came upon Brian Jungen’s “Cetology,” his immense (403.9 x 421.6 x 1491 cm) skeleton of a whale made from sawed-up lawn chairs, of the white, plastic, ubiquitous sort. I loved the silences between the giant ribs, and that when I looked at Jungen’s work bone became plastic became oil and returned to bone. “Cetology” functioned in the manner of metaphor. The visible, made unstable, released multiple meanings. A single substance, through a trick of form and altered understanding, became many substances in the mind’s eye. In Nadia Myre’s Indian Act, silence also plays a crucial role, and the materials combined by the artist suspend the viewer in a state of fecund uncertainty. Nadia Myre is a multidisciplinary artist of Algonquin ancestry based in Montreal whose work explores themes of identity and language through participatory practices. As a decolonial gesture––and with the help of over 250 participants––Myre covered the Canadian government’s Indian Act with glass beads. In replacing the words of the text with white beads and the blank spaces in-between with red, Myre subverts the colonial history embedded in the Indian Act document. In 2012, after I had written several drafts of The Search for Heinrich Schlögel but knew that key elements were missing, elements eluding me, I started transcribing the manuscript onto the backs of postcards, which I mailed to friends, and then to an ever-wider group of people. Over a period of three years, to inscribe the entire novel, as it continued evolving, required 820 postcards. I always copied from my most recent version of the manuscript. All the postcards were scanned before being dropped in the mail-box. My collaborator, Gregory Sharp, did most of the scanning and created the digital archive (www.schlogel.ca). I invited those to whom I sent postcards to record themselves reading the fragments of text they’d received. Every image on every postcard in some way comments on the text written on the back of it. Or that is my hope. Some of the postcards Gregory and I created, using archival photos taken from the twenties to the fifties, of Inuit (often unnamed). On the Internet site, Flickr, I found tourists’ snapshots of Tettnang, Heinrich’s hometown in Germany. I used my own snapshots from when I hiked Heinrich’s hike on Baffin Island, into Auyuiituq. Other postcards I bought in used bookstores, in art galleries, and many I had collected over the years, while traveling. 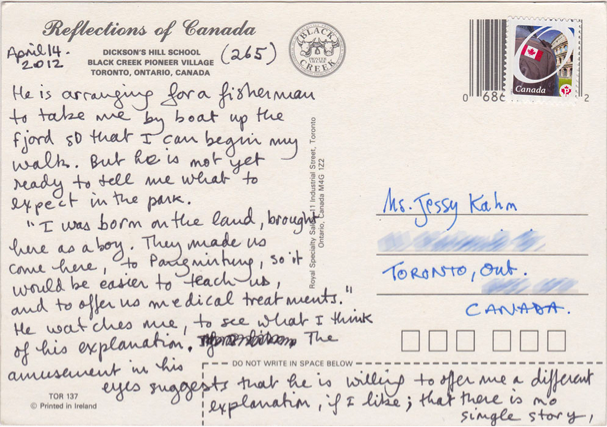 Then I started receiving donations of postcards from individuals, their own personal collections. I wondered how a Star Trek, Disney’s Winnie the Pooh, an Ikea postcard advertising miniature dolls with the promise that ‘role play reduces therapy bills’, or a Titanic postcard might illuminate my novel. Too often, the ‘North’ exists in our minds as a white screen upon which to project iconic images, romanticized historic journeys, our own fantasies of travel and our fantasies of much else. Transferring my novel onto postcards allowed me to dip playfully into an eclectic, collective imagery, an imagery that we as travelers carry inside us when we arrive in the Arctic. 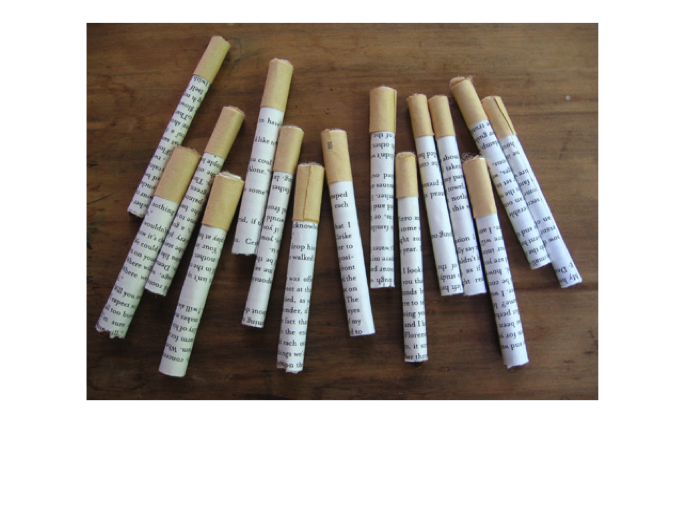 In this art project my novel became a text that traveled. It came into being in large part because of the role Inuit myth plays in the novel. Just as a soul may experience many lives, slipping out of a blade of grass into a raven, into a caribou, into a seal, into a human, so novels or works of travel writing live as many different lives as they find particular readers. Published, September 2014. Pedlar Press in English Canada, Tin House in the US, and Lemeac in Quebec. ‘My grandma, she was born in 1940, out on the land. It was April or May, sometime before the ice breakup. I could tell you the name of the place but it is not on your map. She didn’t know, when they sent her south, she wasn’t going to see her parents for three years. She was lucky, though. It could have been a lot longer. But her parents left the land and settled in Pang. They had to, if they wanted to get her back. There was a day school in Pang. Lots of people didn’t move, [copy editor noted that she didn’t understand this reference not until the dogs died]. I was born April 6, maybe the same day as my grandma, but I am not much like her. I wouldn’t mind being more like her.’—Skype conversation with Vicky, June 18, 2013.